Benares describes their food as ‘Modern Indian cuisine with a contemporary British twist. 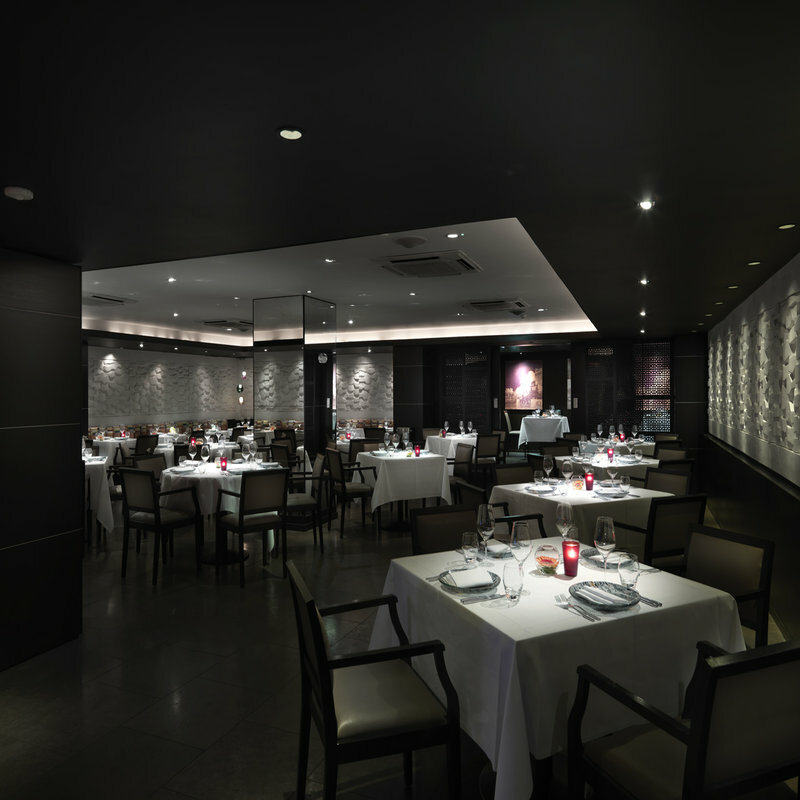 The head chef is Atul Kochhar and Benares received a Michelin star in January 2007. This combined with a location in the heart of Mayfair means that you’ll be paying a lot of money to dine. When you enter the restaurant, there is a cloakroom and then you are escorted upstairs to your table – or the bar area if you are early. The dining area is a low-ceilinged room with ladies seemingly, deliberately seated by the walls, facing outward. The place was full on the Wednesday night that we visited. There is an a la carte menu, but we found the best option to be the tasting menu at £98 per person. We also found a good bottle of Malbec for £44.50 – this was one of least expensive wines on the list. A jug of tap water was provided free. And these weren’t choices – all of the above was included. You can choose wine pairing, but with only 125ml glasses served with each course you’ll add £55 per person for five glasses. My dining companion doesn’t eat meat and so asked for her meat dishes to be substituted with those from the vegetarian tasting menu £89 and that wasn’t a problem – although we were still both charged £98. Every menu item was absolutely delicious – although I wouldn’t have expected anything less. There was probably too much food as we were completely full by the end. Our server was friendly and attentive and in keeping with the casual dining style of the place. On leaving the restaurant we found a homeless woman begging just to the right of the entrance door and that made us feel even guiltier for spending so much on dinner. Fab review! Sounds delicious, bit surprised at the amount of the service charge though! Thanks. I suppose the service charge is only 12.5% – just feels like a lot because the bill was so high.